This book is a variation on the stick and elastic book. Because the plastic piece from the socks has a place for the elastic, I was able to wrap the elastic in the curves and run it along the inside of the folded pages. As I made sample books for the Homes for Poems workshop at the Massachusetts Poetry Festival in Lowell, I had fun playing with recycled materials. This book used the side panels from a grocery bag for the pages, a plastic piece that came with a purchase of a pair of socks and an elastic for the binding, and candy wrappers, fruit stickers, and the left over sticky paper from red and green dot stickers that were left over from jurying at the Newburyport Art Association to decorate the pages. 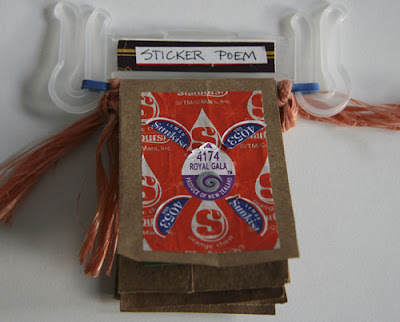 The poem was inspired by the fruits the stickers were on. You can view the entire book here. As I was preparing for the workshop, I spent some time selecting a collection of poetry anthologies for children. You might not always want to write an original poem for your book; sometimes it's fun to use one of your favorite poems. Here is an annotated list in no particular order. Caroline Kennedy, paintings by Jom J Muth. New York: Hyperion Books for Children, 2005. I like the collection of poems and Caroline Kennedy's reminiscences about reading and reciting poetry aloud with her family. Selected by James Berry, illustrated by Katherine Lucas, San Francisco: Chronicle Books, 2002. Poems from more than fifty countries include traditional poems and songs and ones by contemporary poets. A nice introduction by James Berry closes with "Perhaps the poems in this anthology will build bridges for you. This collection offers you fresh poems as new acquaintances, which I hope will become new friends." Selected by X.J. Kennedy and Dorothy M. Kennedy, illustrated by Jane Dyer. Boston: Little, Brown and Company, 1992. This delightful collection of poems for children is organized in the following sections: Play; Families; Just for Fun; Birds, Bugs, and Beasts; Rhymes and Songs; Magic and Wonder; Wind and Weather; Calendars and Clocks; Day and Night. The poems are great for reading aloud. selected by Jack Prelutsky, illustrated by Arnold Lobel. New York: Random House, 1983. This was the poetry anthology we had in our library when my kids were young. There are lots of great poems organized in sections like The Four Seasons, Dogs and Cats and Bears and Bats, I'm Hungry!, and Alphabet Stew. edited by Bernice E. Cullinan, illustrated by Andi MacLeod. Honesdale, PA: Wordsong, Boyds Mill Press, 1996. Poems by David McCord, Aileen Fisher. Karla Kuskin, Myra Livingston Cohen, Eve Merriam, John Ciardi, Lilian Moore, Arnold Adoff, Valerie Worth, and Barbara Esbensen are accompanied by a portrait of the poets, their writing about writing poetry, and a short biography. selected by Georgia Heard, illustrated by eighteen renowned picture book artists including William Steig and Melissa Sweet. Cambridge, MA: Candlewick Press, 2002. Georgia Heard was asked by a friend who is superintendent of District 2 schools in Manhattan to gather poems of comfort for New York schoolchildren who had witnesses the World Trade Center tragedy. These poems can bring comfort to all children, and adults, in whatever trying times they find in their own lives. selected by Paul Janeczko, illustrated by Robery Rayevsky. New York: HarperCollins Publishers, 2007. A selections of poems from humorous to serious written to things: sneakers, mosquitos, snowflake, buffalo, hat hair, the Vietnam Memorial. In the preface, the editor suggests writing your own poems to things and these are great inspirations to get started. Talking to the Sun: An Illustrated Anthology of Poems for Young People selected and introduced by Kenneth Koch and Kate Farrell. New York: Metropolitan Museum of Art, Holt, Rinehart and Winston, 1985. A wide-ranging selection of poems ranging across time and place are illustrated with works from the Metropolitan Museum of Art. A feast of words and images. selected by Beatrice Schenk de Regniers, Eva Moore, Mary Michaels White, and Jan Carr, illustrated by Marcia Brown, Leo and Diane Dillon, Richard Egielski, Trina Schart Hyman, Arnold Lobel, Maurice Sendak, Marc Simont, and Margot Zemach. New York: Scholastic, Inc., 1988. The well-chosen poems are grouped by theme and illustrator: themes and illstrators include Fun with Rhymes illusterated by Trina Schart Hyman, Mostly Weather illustrated by MArcia Brown, Mostly Animals by Arnold Lobel. selected by Belinda Hollyer, illustrated by Holly Swain. New York: Kingfisher, 2003. The family poems in this volume are broad in scope. They go from humorous to sad and include all kinds of families. A poem called I wish I was (an only child) is followed by I have none. edited by Jan Greenberg. New York: Harry N. Abrams, Inc. Publishers, 2001. American poets were invited to choose a work of twentieth -century American art and write a poem inspired by it. The results were organized into four categories: Stories (poems about the art that tell an aanecdote or conjure a memory), Voices (poet steps inside the painting and assumes the voice of the person or object), Impressions (poets paint word pictures of the work of art), Expressions (poets explore aspects of visual form that concern the nature of art and the artist). The book is wonderful to look at and view and also can make a starting point for a collaboration between art and language arts teachers or for a visit to the museum.